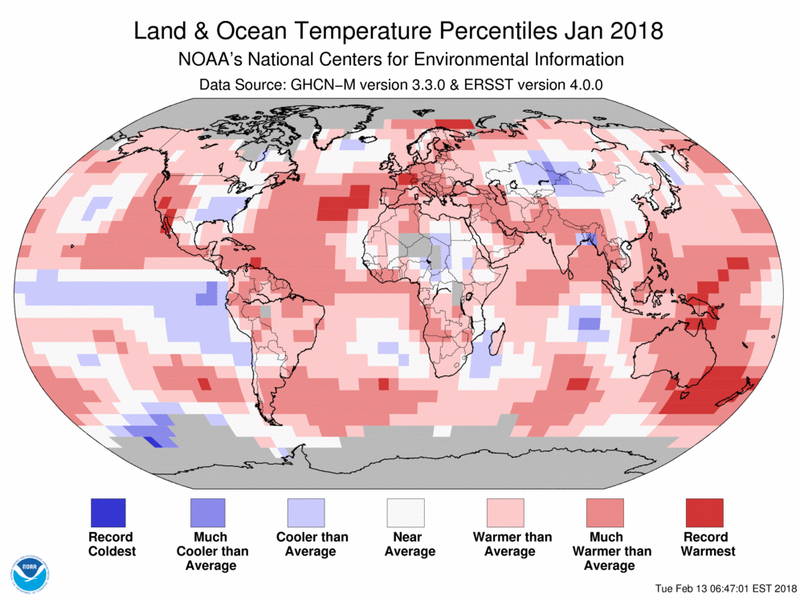 The globally averaged temperature over land and ocean surfaces for January 2018 was the fifth highest for the month of January in the NOAA global temperature dataset record, which dates back to 1880. This monthly summary, developed by scientists at NOAA's National Centers for Environmental Information, is part of the suite of climate services NOAA provides to government, business, academia and the public to support informed decision-making. The January temperature across global land and ocean surfaces was 1.28°F above the 20th century average of 53.6°F. This was the fifth highest for January in the 1880-2018 record. The last four years (2015-2018) rank among the five highest Januarys on record. The January globally averaged land surface temperature was 2.00°F above the 20th century average of 37.0°F. This value was the lowest temperature departure from average since 2013 and the eighth highest January land global temperature in the 1880-2018 record. The January globally averaged sea surface temperature was 1.01°F above the 20th century monthly average of 60.5°F – tying with 1998 as the fifth highest global ocean temperature for January in the 1880-2018 record. 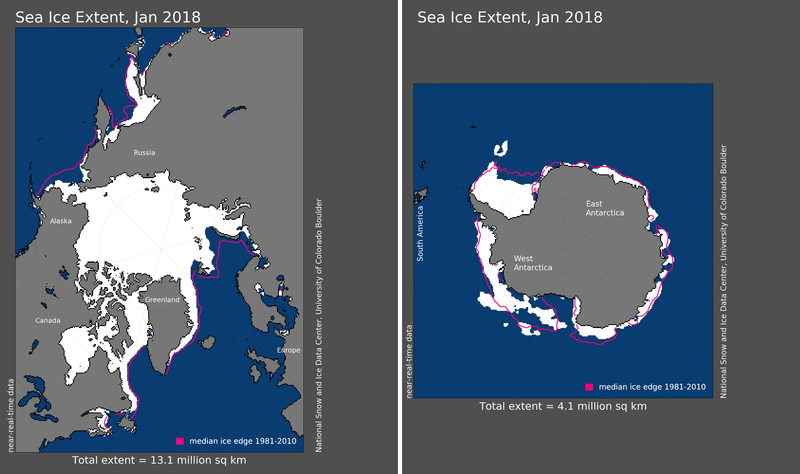 The January average Arctic sea ice extent was the smallest in the 39-year record at 525,000 square miles (9.4 percent) below the 1981-2010 average, according to analysis by the National Snow and Ice Data Center using data from NOAA and NASA. The monthly extent was 42,500 square miles smaller than the previous record set in 2017. Sea ice coverage was below average in the Barents, Kara and Bering Seas. Antarctic sea ice extent during January was 340,000 square miles (17.4 percent) below the 1981-2010 average, the second smallest January extent on record. Only the Antarctic sea ice extent in January 2017 was smaller. Below-average ice coverage was observed in the Ross and West Amundsen Seas. According to data from NOAA and analyzed by the Rutgers Global Snow Lab, the Northern Hemisphere snow cover extent during January was 20,000 million square miles above the 1981-2010 average. This ranked near the median value in the 52-year period of record. The North American and Eurasian snow cover extents were each slightly above average. 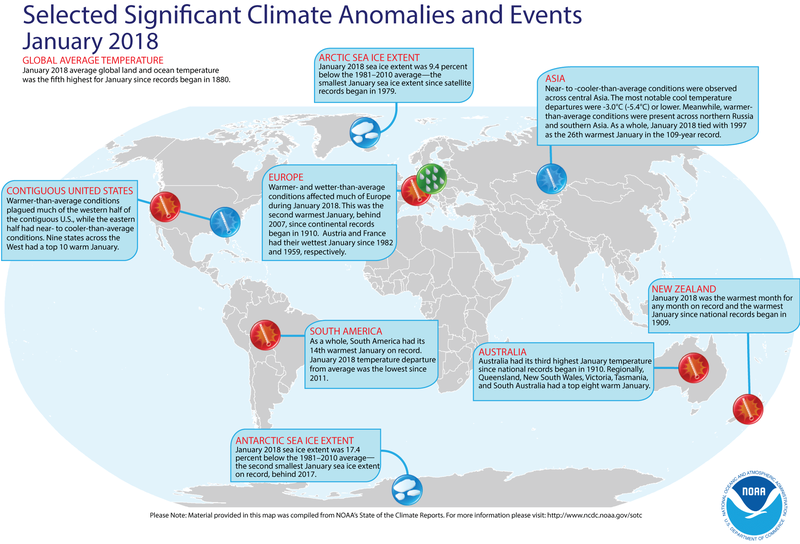 For a more complete summary of climate conditions and events, see our January 2018 Global Climate Report. The global land and ocean temperature departure from average for May 2018 was the fourth highest on record for the month of May. During May 2018, the average contiguous U.S. temperature was 65.4°F, 5.2°F above the 20th century average. The global land and ocean temperature departure from average for September 2018 was fourth highest on record for the month of September. During September 2018, the average contiguous U.S. temperature was 67.8°F, 2.9°F above the 20th century average.